(Aug 14, 2015) Reign made history Wednesday night with record attendance at a home game. Over 6,000 fans packed the stands in the north end, spilling over into the south end of Memorial Stadium, as Reign defeated Houston Dash 2-1. EYSA players, friends and families turned out for EYSA Night to cheer on Reign FC, as well as the US National team players on both sides in their first appearance in Seattle since hoisting the World Cup: Hope Solo and Megan Rapinoe for Seattle; Carli Lloyd, Morgan Brian and Meghan Klingenberg for Houston. Players from all EYSA clubs were able to get autographs after the match, including from World Cup superstar Carli Lloyd, who even posed in selfies with a handful of her ecstatic young fans. Eastside FC's Mercer Island Jr. RCL team served as ball girls for the match, and got to see the action from field level. 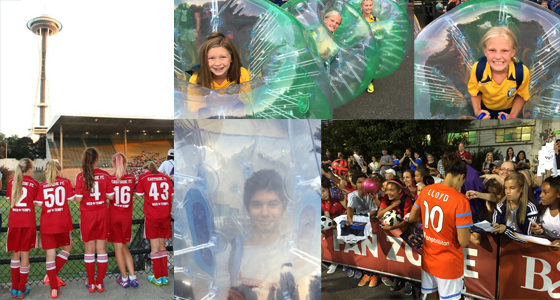 Ten lucky players ranging from U10 to U15 from Belluevue Youth Soccer and Eastside FC provided half-time entertainment for the crowd as they donned plastic air-filled bubble suits and tried somewhat unsuccessfully to stay on their feet as they played 5v5 bubble soccer. The participants were unanimous in their enthusiasm and enjoyment of the relatively new sport, almost as much as the appreciative record crowd. It was a beautiful night in Seattle, made even better by the home team victory. Thanks to all our EYSA players and families for turning out.